A few days ago I posted information about tapas or small plates to be used over the holiday week-end. (https://www.menupause.info/archives/16743). 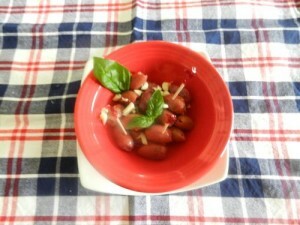 I decided to make some that would also qualify as appetizers, and the list I made was tentative. Today and my next posting will have what I actually create. Some have no amounts, just ingredients, because the amounts are at your discretion. Place all the ingredients in a deep bowl and refrigerate for a few days. 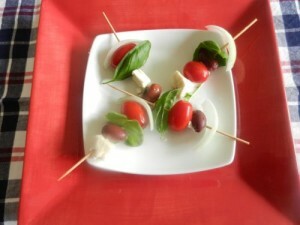 Place each on a short skewer in any order. I like onion crescent to start and then mix ‘n match. 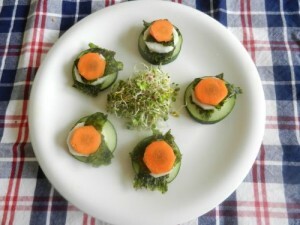 then seaweed and finally slice of carrot on top. Eat in one bite! This tapa takes the most time (about 30 minutes) and needs more exact measurements, although there is some leeway in amounts*, depending on your taste preferences. Sauté sliced onions, mushrooms and garlic in a large fry pan in 2-3 tablespoons olive oil. Simmer trimmed and cut green beans in saucepan for about 5 minutes. While these items are cooking, grind walnuts in coffee grinder or blender and slice 1/2 of the second onion. When mushrooms and onions are cooked (with onions beginning to caramelize) and green beans are drained, start adding all the ingredients into a food processor, in small batches: onion/mushroom/garlic mix, walnuts and raw onion. Place each well-processed batch into a large bowl. Mix well, adding salt and pepper to taste. Chill. 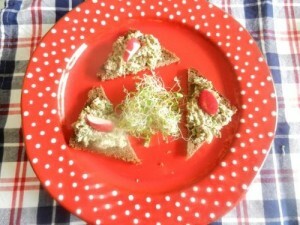 Right before serving, spread paté onto bread triangles or crackers and top with a small radish slice. Enjoy! Note: You can increase or decrease the amount of onion or nuts or green beans, according to your preference. But I do suggest you keep at least the one cup of nuts to help the mixture stay together. 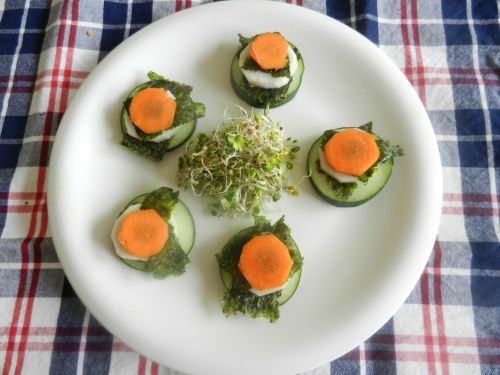 This entry was posted on Friday, July 3rd, 2015 at 11:32 am	and is filed under Kitchen Nutrition. You can follow any responses to this entry through the RSS 2.0 feed. You can skip to the end and leave a response. Pinging is currently not allowed.